The Dumfries and Galloway Council and M. A. Productions Dumfries are delighted to announce the line up for this year’s brand new Pantomime at DG1 in December. The Pantomime producers of ‘Aladdin’ M. A. P. produced all 4 previous shows at DG1 before its closure and say this pantomime promises to be bigger and better than ever before with a star studded cast. 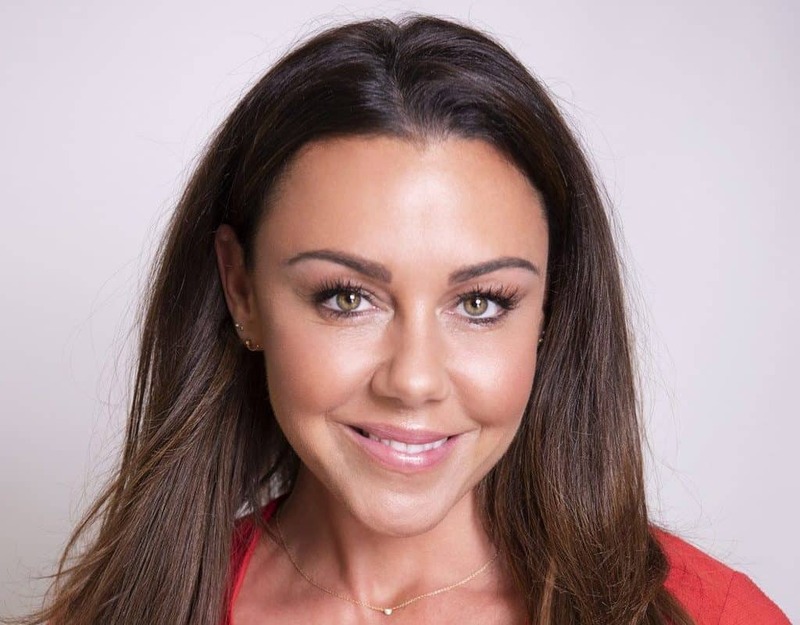 Stunning Michelle Heaton will appear as the oh so funny ‘Slave of the Ring’. The TV presenter and pop princess not only had a top number 1 selling book in 2018 ‘Hot Flush: Motherhood, the Menopause and Me’ but she also took part in the ‘Real Full Monty Ladies Night’ in March 2018. As the result Michelle has just received in February this year a Broadcast Award for the ‘Best Popular Factual Programme’ for this Production and Stop Press! just a few days ago on 20th March she also won The Royal Television Society Award for the programme as well!! 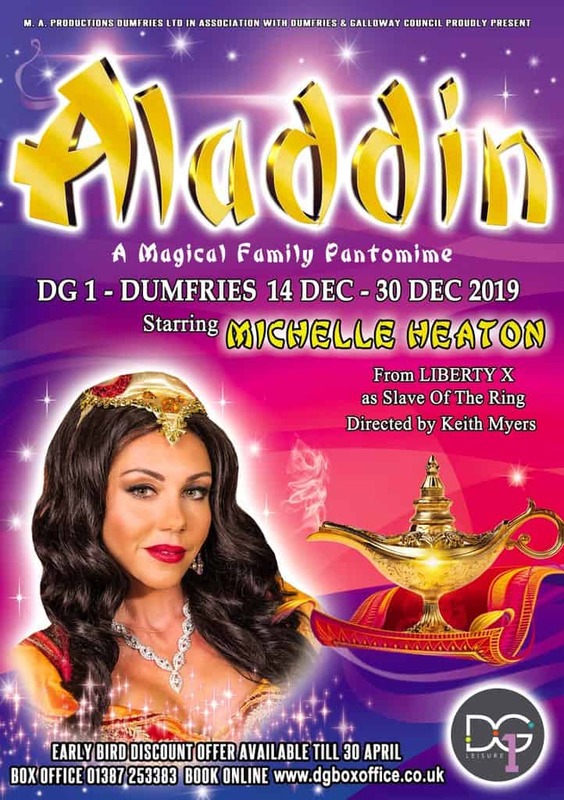 A well-seasoned actress, Michelle has appeared in numerous Pantomimes around the country as leading lady and is looking forward to spending Christmas in Dumfries. Joining Michelle is one of Scotland’s most aspiring new playwrights, funny man Kenny Boyle who plays the mischievous role of ‘Wishee Washee’ and his brother ‘Aladdin’ is played by the dashing and incredibly talented Kieran Francis Begley who played the role of Aladdin last year at the Ayr Gaiety. Alan McClaren is working hard with her laundry as Widow Twankey, the loveable and infectious costume changing mum. Robyn McEnaney, an actual Princess for Disney, joins the cast as the beautiful Jasmine, Aladdin’s love interest and the wicked and evil magician Abanazer, played by Ronni Menzies-Stirling throws his weight around looking for the treasure. But in the end it’s PC Ping who lays down the law and the Genie who comes to the rescue both in the guise of Adam Buksh. All will be revealed in this spellbinding pantomime full of magic and mayhem, special effects, breath-taking sets, loads of laughs and lavish costumes is the perfect Christmas treat for all the family at DG1 Dumfries and is guaranteed to be the biggest of them all!